This image of the 30 Doradus Nebula, a rambunctious stellar nursery, and the enlarged inset photo show a heavyweight star that may have been kicked out of its home by a pair of heftier siblings. The image was taken by the Wide Field and Planetary Camera 2 (WFPC2) aboard the NASA/ESA Hubble Space Telescope. The heavyweight star, called 30 Dor #016, is 90 times more massive than the Sun. In the wider view of 30 Doradus, taken with European Southern Observatory’s (ESO) Wide Field Imager at the MPG/ESO 2.2-metre telescope in Chile, the homeless star, located on the outskirts of the nebula, is centred within a white box. 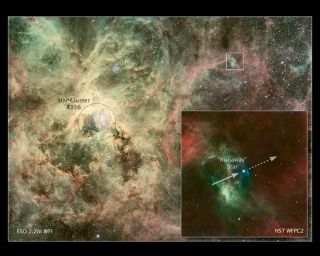 A massive runaway star has been spotted by the Hubble SpaceTelescope racing away from the its home stellar nursery after being kicked outby some of its much heftier stellar siblings. The homeless star is on the outer fringes of 30 DoradusNebula ? commonly known as the Tarantula Nebula ? a teeming stellar breedingground in the Milky Way's nearby galactic neighbor, the Large Magellanic Cloud. The star, which is about 90 times as massive as our own sun,is racing through space at a speed of about 250,000 mph (400,000 kph), a speedthat would get you to the moon and back in about two hours. The finding is yet more evidence that the most massivestars in the local universe can be found in the Tarantula Nebula, making ita unique laboratory for studying heavyweight stars. R136 is nestled inside theTarantula Nebula, which is located 170,000 light-years from Earth and containsseveral stars topping 100 solar masses each. The new observations offer insights into how massive starclusters behave. "These results are of great interest because suchdynamical processes in very dense, massive clusters have been predictedtheoretically for some time, but this is the first direct observation of theprocess in such a region," said Nolan Walborn of the Space TelescopeScience Institute in Baltimore, Md., and a member of the COS team that observedthe misfit star. "Less massive runaway stars from the much smaller OrionNebula Cluster were first found over half a century ago, but this is the firstpotential confirmation of more recent predictions applying to the most massiveyoung clusters," Walborn said. Runaway stars can form in one of two ways. A star mayencounter one or two heavier siblings in a massive, dense cluster and getbooted out through a stellar game of pinball. Or, a star may get a superchargedcosmic kick from a supernovaexplosion in a binary system, with the more massive star exploding first. The first process is suspected to have sent this particularstar packing. "It is generally accepted, however, that R136 is youngenough that the cluster?s most massive stars have not yet exploded assupernovae," said COS team member Danny Lennon, also of the SpaceTelescope Science Institute. "This implies that the star must have beenejected through dynamical interaction." Astronomers have been tracking this rogue star since 2006when a team led by Ian Howarth of University College in London spotted it withthe Anglo-Australian Telescope at the Siding Spring Observatory in Australia. That observation revealed that the stellar misfit is an exceptionallyhot, massive blue-white star that is relatively far from any cluster in whichsuch stars are typically found. Hubble astronomers then picked up another clue when theyused the star as a target to calibrate the COS instrument, which was installedon Hubble in May 2009 during final servicing mission to the joint NASA-EuropeanSpace Agency space telescope. It was those ultraviolet spectroscopic observations, performedin July 2009, which showed that the wayward star is unleashing a fury ofcharged particles in one of the most powerful stellar winds known, researcherssaid. That was a clear sign that it is extremely massive, perhaps as much as 90times heavier than the sun, they added. The star, therefore, also must be very young, about onemillion to two million years old, because extremely massive stars only live fora few million years, Hubble researchers said. The new observations of the star are detailed in the May 5online edition of The Astrophysical Journal Letters. The renegade star may not be the only runaway in the region. Two other extremely hot, massive stars have been spottedbeyond the edges of the Tarantula Nebula. Astronomers suspect that these stars mayalso have been ejected from their home. They plan to analyze the departingstars in detail to determine if the nebula is unleashing a barrage of massivestellar runaways into its surrounding neighborhood. Meanwhile, the wayward star R136 will continue to streakacross space, said team member Paul Crowther of the University of Sheffield inEngland. It should eventually end its life in a titanic supernova explosion,likely leaving behind a remnant black hole, he added.